Diet and weight loss is a multi-billion dollar industry. Fad diets and magic pills come and go, but it usually comes down to eating less and exercising more. However, as we age our metabolism naturally becomes slower. A slower metabolism is especially a problem for women. Though fad and low-calorie diets may ultimately fail, there are healthy natural ingredients to help boost your metabolism and burn those unwanted pounds around your middle. This unique blend of three simple ingredients works together to help you lose weight and control your blood sugar. 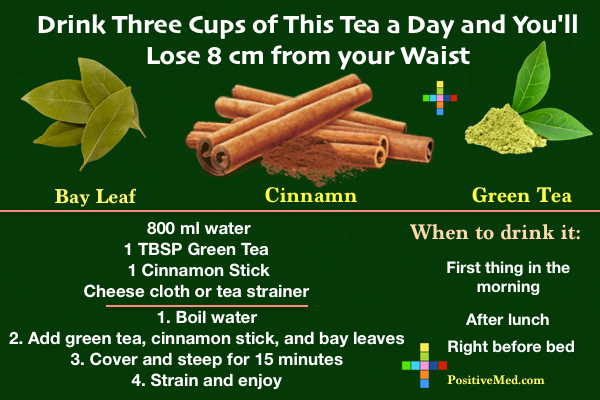 If you drink this weight loss tea three times a day, you will lose eight centimeters from your waist. The great thing about the ingredients listed below is that not only do they help with weight control, but have other health benefits as well. These ingredients are also considered relatively safe. • Green Tea– The two main ingredients in green tea which may assist in weight loss are caffeine and ECGC. Caffeine helps to burn fat and may also make your workout more productive. ECGS is an antioxidant which helps boost the metabolism. The ECGS and caffeine benefit each other since the caffeine gives the ECGC a head start. • Cinnamon– Not only is cinnamon delicious, but it also helps to control your weight in many different ways. It controls insulin and decreases blood sugar. Cinnamon may also contribute to lowering LDL cholesterol while also speeding up your metabolism and suppressing your appetite. • Bay Leaf– Bay leaf is another common culinary herb that not only flavors your stew but also reduces glucose levels and reduces bad cholesterol.